Who doesn't love a good knockoff? There's not much I like knocking off more than stuff I am drooling over in the Pottery Barn or West Elm catalogs. As soon as I saw West Elm's adorable burlap trees I knew I could make them for far less than $25. To make the cone shape base, I simply wrapped a piece of cardstock around itself. I taped the overlapped edge to make sure it stayed. Then I cut strips of burlap. I didn't measure and they weren't all the same length. They weren't even all the same width, I just eyeballed it. In general they were probably each about half an inch wide and 4-5 inches long. I probably used between 50-75 strips of burlap to cover my tree. I tried to make the burlap loops right on the tree, but they weren't sticking - except to my fingers. So I made each burlap loop first - securing the cross with a dot of hot glue. Then I attached each loop individually with another dot of glue on my paper cone. I started in the middle of my tree and worked up, but my suggestion would be to start at the bottom and work up. The West Elm burlap trees are very neat with the loops in very straight lines around the tree. This wasn't happening for me so I just kinda went with it. The reason I say start at the bottom is because then you can put the next level's dot of glue close enough to the lower level and cover the white paper completely leaving as few holes as possible. For the very top of the tree, I turned one of the loops upside down so the tip of the tree was actually covered by the loop. After my whole tree was covered in burlap loops I sprayed it with acrylic sealer. This just makes the burlap a little stiffer so it doesn't fray as easily. You can make these all different sizes, but cutting the paper down to different sizes. 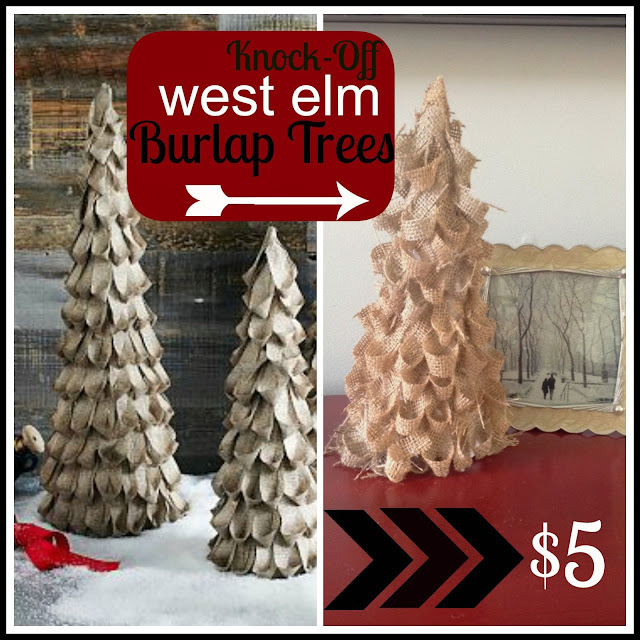 Aren't these little burlap trees a great winter decoration? Oh, and you just can't beat the price!